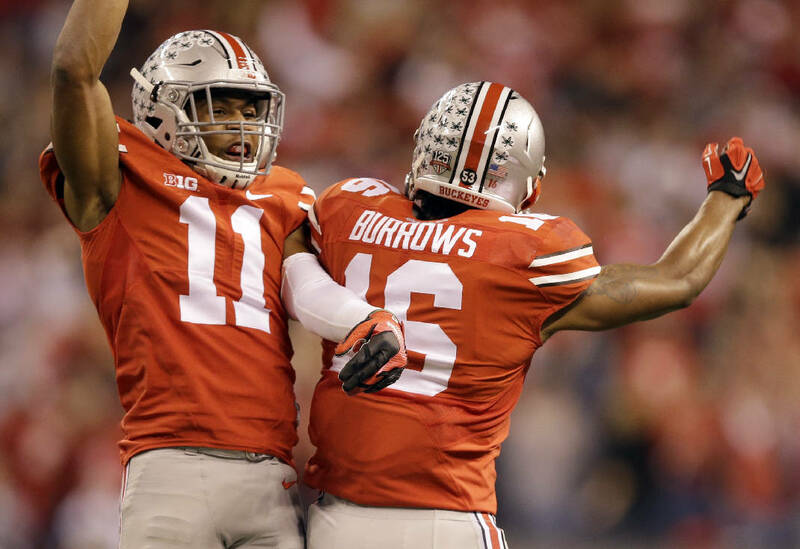 Ohio State defensive back Vonn Bell, left, is congratulated by teammate Cam Burrows after intercepting a pass during the first half of the Big Ten Conference championship on Dec. 6 in Indianapolis. In December 2012, Ridgeland High School defensive back and running back Vonn Bell entered the Chattanooga Times Free Press building to have his picture taken for the Best of Preps all-star team. The five-star prospect was covered in Alabama gear. "I remember wearing those sweatshirts," Bell said by phone this past week. "It's been quite a journey and quite a dream thinking about the schools that gave you offers to come play. I picked one, and now I'm going against another." Bell is now preparing for the top-ranked Crimson Tide as a sophomore safety with the Ohio State Buckeyes, who claimed the final spot in college football's inaugural four-team playoff. Alabama and Ohio State will vie New Year's night in the Sugar Bowl, with the winner going on to play the Rose Bowl winner between second-seeded Oregon and third-seeded Florida State. Despite being a lifelong Tennessee fan and despite being recruited by an Alabama program coming off consecutive national championships, Bell made a decision that was surprising to many in February 2013. He bypassed the Volunteers and Tide and signed with a Big Ten power. "Ohio State was always in the forefront," recently retired Ridgeland coach Mark Mariakis said. "Vonn Bell is a kid who is drawn and attracted to relationships. His family is so close-knit. He had a nurturing relationship with his family, and when he came to Ridgeland, he saw the same thing. "He told me that Ohio State reminded him of Ridgeland in terms of the relationships they try and have with their players. That always had Ohio State in the forefront through the entire process. Somebody was always chasing Ohio State regardless of what clothes he had on." Bell was an impressive signee for the Buckeyes given that he was the nation's No. 25 overall prospect according to Scout.com, No. 29 according to 247Sports.com and No. 32 according to Rivals.com. It also sent the message that Buckeyes coach Urban Meyer would continue to have a Deep South presence well after guiding Florida to national titles in 2006 and '08. Beating out Crimson Tide coach Nick Saban for a coveted recruit doesn't happen with great regularity. "We thought Vonn Bell was an outstanding player, and we certainly wanted him in our program," Saban said earlier this month. "If he was in our program right now, he would be a very productive player for us." He's certainly producing for Ohio State. Bell ranks second on the Buckeyes with 78 tackles, and he is also second with 17 passes broken up or deflected. He is tied for the team lead with five interceptions. "He's having a pretty good year," Meyer said. "He's our starting safety, and he came in last year and was very instrumental in special teams. I probably should have pushed harder as far as getting him in the games a little more as a freshman. He's a very talented guy and was a highly recruited guy who could have gone anywhere. "To go down to the South and get a guy from Alabama and Tennessee he's just a big part of who we are." This time last year, Bell was gearing up for his first career start against Clemson in the Orange Bowl. He snagged an acrobatic interception in the second quarter near the Ohio State goal line, but the Buckeyes didn't have enough of those plays in a 40-35 loss. Clemson quarterback Tajh Boyd riddled the Buckeyes on 31-of-40 passing for 378 yards and five touchdowns, with star receiver Sammy Watkins collecting 16 catches for 227 yards and two scores. "That really gave me the feel of a big-time game," Bell said. "In big-time games, you have to take your talent up to the next level, and that loss in the Orange Bowl gave me a chip on my shoulder as far as offseason training. I didn't like that feeling I had of that knot in my stomach after we lost, so it made me train that much harder to be a champion. "It was a good learning experience, because I think it made me grow and develop. I think I'm becoming a leader on this year's team and a face of the defense." Last season's bowl challenge was Watkins, who was the fourth overall selection in May's NFL draft. Now the challenge is helping defend Alabama's Amari Cooper, who finished third in the Heisman Trophy balloting. "That's what college football is all about, playing the best of the best," Bell said. "It was quite an experience going up against Sammy Watkins last year, but it was also a blessing, because it helped me raise my game up higher. This will a great competition and a great environment, too." Bell arrived in Chattanooga last Sunday and stayed until Friday, when he flew back to Columbus. The team then headed to New Orleans on Saturday and is scheduled to resume practices today as the sport's anticipated playoff approaches. When asked if his teammates would give him grief if they saw a picture of him decked out in Crimson Tide paraphernalia, Bell laughed. "Yeah, they would," he said. "I wouldn't let them see that. I think my mom gave that Alabama stuff to my cousins."